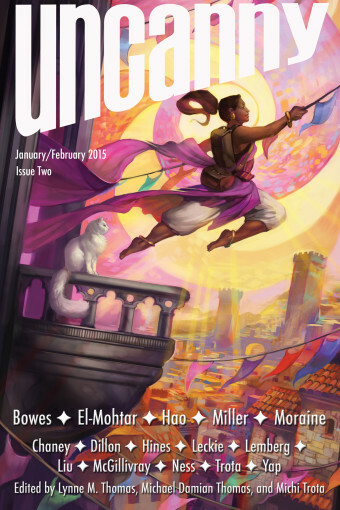 Uncanny‘s first issue of 2015! All of the content will be available for purchase as an eBook (PDF, EPUB, MOBI) on January 6, 2015. The free online content will be released in 2 stages- half on January 6, and half on February 3. Featuring new fiction by Hao Jingfang (translated by Ken Liu), Sam J. Miller, Amal El-Mohtar, Richard Bowes, and Sunny Moraine, classic fiction by Ann Leckie, essays by Jim C. Hines, Erica McGillivray, Michi Trota, and Keidra Chaney, poetry by Isabel Yap, Mari Ness, and Rose Lemberg, interviews with Hao Jingfang (Ken Liu translating) and Ann Leckie by Deborah Stanish, and Julie Dillon’s Fortune’s Favored as the cover. All of that plus two podcasts! 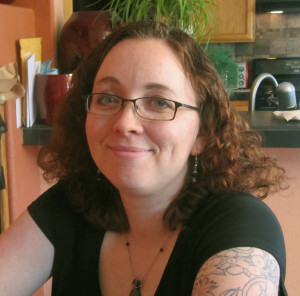 Episode 3 (January 6): Editors’ Introduction, Sam J. Miller’s “The Heat of Us: Notes Toward an Oral History” (Read by C.S.E. Cooney), Isabel Yap’s “After the Moon Princess Leaves” (Read by Amal El-Mohtar), Interview with Sam J. Miller conducted by Deborah Stanish. Episode 4 (February 3): Editors’ Introduction, Amal El-Mohtar reading her story “Pockets,” Rose Lemberg’s “archival testimony fragments / minersong”(Read by C.S.E. Cooney), Interview with Amal El-Mohtar conducted by Deborah Stanish.